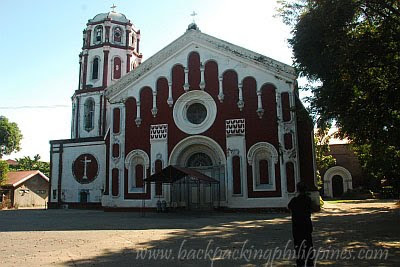 Sandwiched between the town of Santa Cruz and Candon City is the town of Santa Lucia where Tutubi made a short stopover just to check out Sta. Lucia Church that made the whole trip sound really like an Ilocos Visita Iglesia itinerary. 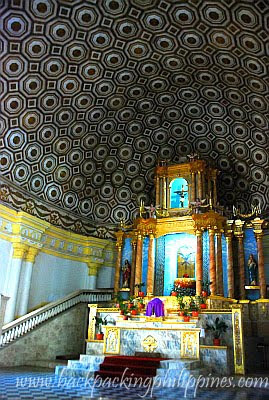 The church is listed by Ilocos Sur tourism people as a must-see and Tutubi went there to verify. From the national highway, Tutubi caught sight of the church to the left and beside a basketball court and quickly turned to pay a short visit to the church dedicated to St. Lucy (Santa Lucia) whose feast day falls on December 13 (the Virgin of Santa Lucia (St. Lucy) is the patron saint of people with eye problems (that's why Catholics with failing eyesight pray to her for intercession). Photo of Sta. Lucia Church facade at a time most photographers won't even dare touch the camera due to bad lighting and harsh shadows. The best time take a photo of the church's facade is really in the early morning for it's facing east. The interior of the church sports typical baroque style with the four evangelists depicted on the four columns supporting the apse (the technical term for the dome near the main altar) and the presence of an. There's a nice colorful pattern on top of the altar, Rennaisance style, that could've been captured brightly if the lights were on but Tutubi, ever lazy to bring a tripod, just made use of the limited available light.